Suzuki Motor Corporation will enter the off-road utility vehicle market by utilizing its business alliance with Kawasaki Heavy Industries, Ltd. Suzuki will introduce its branded version of the Kawasaki-produced MULE 3010 4x4 utility vehicle at the American Suzuki Motor Corporation (ASMC) Dealer Meeting on June 13, 2004, in Las Vegas, Nev. Suzuki will begin marketing the utility vehicle in July 2004 in North America. 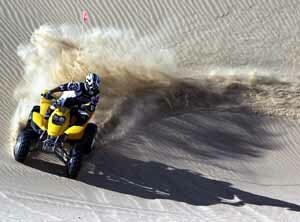 Families love off-road fun; experts recommend limitations. Educational programs could help lessen increasing conflicts between hunters on foot and sportsmen on off-road vehicles, a group that advocates safe and responsible use of such vehicles said. new management plan for the sprawling Chequamegon-Nicolet National Forest could reduce logging in the forest, and for the first time, it will allow the use of all-terrain vehicles in the Nicolet, in northeastern Wisconsin. 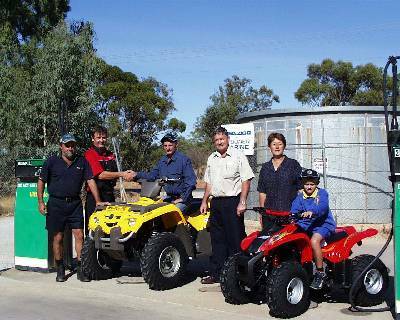 Delighted to receive their new Bombardier ATV's are Phil Ward and Sean Bowen of Moora. All-terrain vehicle use will be allowed in the Chequamegon-Nicolet National Forest so long as riders stay on a limited number of posted trails and roads, the U.S. Forest Service says. April 29, 2004--Polaris Industries this week was awarded a 5-year, $10.3 million contract by the United States Department of Defense's Special Operations Command for the production and delivery of up to 700 Polaris all-terrain vehicles. U.S. military forces in Afghanistan and Iraq currently use Polaris ATVs. So you want to go racing? A group of local all terrain vehicle riders responded to Monday's drowning incident in a remote strip mine pond in Newport Township, hoping to help in any way possible.